Our simple shipping calculator will help you save time looking for the best shipping rates as we take your package details and connect you with cheap shipping rates. Whether you are shipping in the USA over the holidays, or need to post a package overseas to customers or loved ones, you will be able to find a courier that suits you. The most important thing to remember over the holiday season is making sure you meet all important Holiday shipping deadlines to ensure that your packages arrive on time. These deadlines vary depending on which type of delivery service you book and also where you are shipping to. It goes without saying that you should leave as much time as possible to post items. Not only will this ensure a more relaxed Christmas period for you, but it will also give you some margin for error, just in case there are any problems with postage. 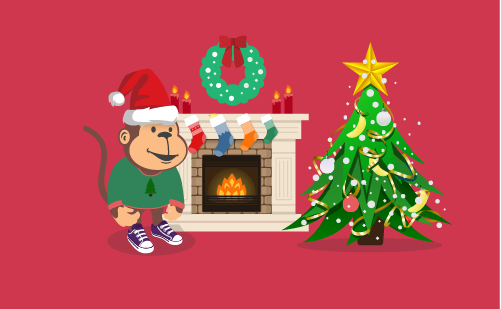 The number one reason people choose to post a package with Parcel Monkey is the price. We have some of the lowest domestic and international shipping prices around as we work with courier partners providing them with huge numbers of orders, in return for cheaper rates. The quality of our services are still the same as booking direct at the Post Office or with a courier, only when you book online with us the cost is cut. These savings can then be spent as you please, on marketing your products if you run a small business or if you are simply sending holidays gifts - an even better gift! We all know that Santa takes pride in delivering his presents and so should you! Although gift wrap looks nice it isn't any good for shipping. Keep all the fancy gift wrap, strong and bows inside of a sturdy box and take the time to package any presents properly. Our customers have different needs, some need shipping to be cheap and help them keep to a tight budget, whereas others require delivery to be made as quickly as possible. The express courier services that are available via the Parcel Monkey shipping calculator, are supplied by carriers such as USPS, FedEx, and DHL. They will be able to get your post to destinations quicker than the Post Office and often for a cheaper price. If you have enough time before the holiday shipping deadlines, you can use economy services such as tracked mail couriers like DHL eCommerce and TrakPak and reduce the amount you need to spend on shipping massively. Parcel Monkey allows you to compare courier services so not only can see which is the best deal, how highly other customers rate the service or how long delivery takes but also that you can choose to have a courier come and pick up from your doorstep. This is ideal if you don't want to queue up at the Post Office or you run a business and over the holidays don't have time to drop off. Equally some of our customers want to save a few extra dollars or aren't able to wait around for a courier pick up so we offer Drop Off options too. For those who sell online, we have made connecting Shopify and eBay stores simple to connect via our new bulk shipping tools - and this then means you can keep tabs on all of your shipping from one place. This can speed up your order fulfilment and help you keep shipping costs in check. Keeping an eye on deliveries is important to all of our customers so we offer a tracking tool so that both the sender and recipient can monitor the progress of a package. In order to minimize any Christmas Customs issues, allow plenty of time for international packages as they will be shipped along with the millions of others over the holiday season, and will still need to be cleared by Customs. Make as clear as possible what's in the packages, in fact. A correctly completed and detailed customs form will help customs establish what is in your box. This should be attached securely in a document wallet to the outside of the package. Always provide a working contact number of the recipient. Customs may need to call them to collect any Customs Duty owed before a delivery can be made. Customs Officers calculate duty based on the value of the items, the contents of the package, their own Customs documentation and more. The responsibility does fall to the person receiving the goods as all Parcel Monkey shipments are shipped DDU. Many countries, don't charge duty on gifts up to a certain amount but some locations do and on specific items or over a certain value. So, to avoid hold-ups at customs and unexpected charges, it's worth looking up the rules of the country you're sending to. Write both the delivery address and the address you wish the package to be returned to in case of problems. Make sure the addresses are attached securely, if not written on the parcel itself. As a precaution, you could also put both addresses inside the package as well. You should always check before you post that your item is allowed and not prohibited in the delivery destination or restricted. Over the holiday season items that can cause problems include liquids like perfume and cologne, aerosols and batteries. Other items may not be eligible for compensation, should they be lost or damaged. Glassware and other such fragile objects, for example. While confectionary is perhaps a more surprising one. Check out the non-covered list provided on the Parcel Monkey Restricted Items list.